Something bothers me about Chanukah, which is not really specific to Chanukah but to all the holidays. I understand that winning against the Greeks back then was probably a very big deal to the Jews of that time, and I’m sure they were pretty amazed that the oil burned longer than it was supposed to. But that was a very long time ago, and the Syrian Greeks mean nothing to us now; they are long gone. I don’t really get why we need to celebrate an isolated incident that happened so long ago and has nothing to do with us today. More so, it’s hard to see how someone like me should actually be “happy” about those ancient occurrences that make no difference any more. I’m rambling now, but this has bothered me for a long time and I finally have the chutzpah to express it. I would wager many, many Jews have the same question but never had the chutzpah to ask it. Many times in this column, we have explained the deeper meaning of the Jewish calendar vis-à-vis the Jewish holidays. Time, unlike its meaning in the secular world, is not a continuum or a straight line. The concept of time in Judaism is more like a circle or a spiral. We, the Jewish people, travel through time around that circle, which takes an entire year to traverse its circumference. There are approximately 365 points on that circle, which we call dates. Various important occurrences have taken place on some of those points, when the almighty revealed Himself to the Jewish people in a very open, profound manner. For example, God took us out of Egypt in a miraculous way. The day that happened became a light, a point of illumination on the circle we refer to as the holiday of Passover. This is true for every point of direct and open revelation in our history — such as speaking to us and gifting our people with the Ten Commandments at Sinai. That day became a point of great illumination on the circle that we call Shavuot. Our belief is that every time we traverse that circle, the same exact level of illumination that was revealed at that time in Jewish history is present when we arrive at the point, or date, on the circle. If one would tap into it through careful study, contemplation and meditation, any Jew could actually experience the same feelings of joy, ecstasy and revelation that the Jewish people felt when it actually occurred. We learn from this that a holiday is not just something we do or observe; it’s an opportunity to open a window on the past. We can climb into that window and reconnect to a world beyond the world we live in and assimilate its spiritual energy into the world in which we live. The Talmud explains that when the miracle of Chanukah occurred, the sages did not, in fact, enact the holiday of Chanukah that very year. They waited until the following year to establish it as a holiday for all time. Why would they wait a year? The answer is, Chanukah is not a holiday written in the Torah; it was not a time that God openly revealed His countenance before the entire nation. It was, rather, what is known as a “hidden miracle” in comparison to the splitting of the sea and the like. In order for it to become a holiday for eternity it needs to be proven that it became a “point on the circle,” a time of illumination that can be felt by those who tune into its power and energy. They needed to wait till the following year to test the date and see if the sages of the time; those who were truly tuned in and had their antennae up, could discern its holiness. When they saw they indeed felt the day, they established it as a day of rejoicing for all time; a period which Jews could tap into and be joyous with, learning its timeless messages of trust, hope and belief forever. A joyous last few days of Chanukah to all. This week, I’m going to make my pitch for news, notes and photos at the top of this column rather than the end in hopes to get information across. Thanks to the upcoming secular holidays, we’re spending the next two weeks pushing three issues out the door. In other words, please get information, photos, news, blurbs and so on to me by Friday, Dec. 14, if you want to see it in print in 2012 (or the first week of 2013). What would I like to see? Anything from family get-togethers to photos of kids lighting menorahs, munching on chocolate coins or spinning dreidels. I also want to hear about trips or other events — I attended a couple of Chanukah events this past weekend, and several people came up to me, telling me about trips they went on and events they participated in. “I need to email you,” they told me. As a reminder, here’s my email address: awsorter@yahoo.com. I’ll look forward to receiving this information. Just before Fort Worth Mayor Betsy Price and U.S. Rep. Kay Granger, R-Fort Worth, lit the large menorah, CAS president Murray Cohen announced some new programs the shul has established as it celebrates its 120th year. “We will see the creation of the Hebrew Bible Institute,” Cohen said. This library of scholarly works on the Torah and the prophets will be open to all, with a special interfaith invitation to Christians and Muslims. The Gan Garden, for which groundbreaking took place last month, will grow fresh produce for the Tarrant Area Food Bank. CAS is partnering with the Gladney Center for Adoption to donate diapers and baby formula for children there. Also at the event, it was announced that CAS had collected $650 for the Quarters for Cleaning program, a Fort Worth interfaith effort to give the needy quarters to use in coin-operating clothes-washing machines and dryers. Rabbi Andrew Bloom then presented the organization with an additional $100 worth of quarters. … at the Chanukah Bowl, which takes place from 7:30-9:30 p.m. Saturday, Dec. 15 at Cityview Bowling, 6601 Oakmont Blvd. in Fort Worth. In addition to bowling, the Chanukah Bowl will abound with dreidels, latkes and a light dinner, complete with chocolate gelt for the kids. Cost is $12 per person ($50 maximum per family). For reservations call the Chabad at 817-263-7701 or log onto www.chabadfortworth.com. … that is, if you’re not doing anything else Monday, Dec. 24. Beth-El Congregation is hosting a “Trivia Night and Chinese Dinner,” which will take place at the synagogue, located at 4900 Briarhaven. You can sign up as an eight-person team or individually (with teams being created). The cost is $20 per person and includes a catered Chinese dinner. Sign up by logging onto www.bethelfw.org. The good folks at Congregation Beth Israel in Colleyville are also inviting those in the area to a Chinese or Asian dinner at a yet-to-be determined restaurant. The event will begin at 6 p.m. and Rabbi Charlie Cytron-Walker is taking suggestions (email him at rabbi@congregationbethisrael.org if you have any thoughts). If you’re interested in attending, email Stephanie at administration@congregationbethisrael.org by Dec. 20 so they know how many folks are coming. If you’re worried about your kids being at loose ends during the winter break (and they’ve exhausted all the fun out of their Chanukah gifts), consider sending them to Chabad of Fort Worth & Tarrant County’s Gan Israel Winter Camp during the week of Dec. 24-28. The camp runs from 9 a.m.-3:30 p.m. at the Sonnenschein Chabad Jewish Center, 5659 Woodway Dr. in Fort Worth. Children ages 5 to 12 will participate in arts and crafts, field trips and generally having fun with friends. Questions? What to register? Log onto the website at www.chabadfortworth.com or call 817-263-7701. … Congregation Beth Israel’s Social Action Committee will visit nursing homes on Christmas Day. For more information about how you can become involved, contact Barry Klompus at 817-271-1569 or email him at barry@mlstexashomes.com. The event is taking place in conjunction with TCU’s Brite Divinity School — and Kraemer, who is professor of religious studies and Judaic studies at Brown University, is a font of knowledge on this topic. The season is definitely upon us, and it may be better or worse that Chanukah is early. There have been programs at JCCs and synagogues for years called “The December Dilemma.” The goal of this program was to help parents learn how to handle children’s questions and desires, while remembering our own. Here are a variety of thoughts and ideas — all taken from others wiser than I. We do not need to set up Chanukah as competition or compensation for Christmas. Create meaningful traditions for all of your holidays. There’s more to Christmas and Chanukah than gifts. Judaism celebrates weekly; make a big deal out of Shabbat. The discussion is more important than the solutions. There are no right or wrong answers on how to deal with Santa Claus, lights, songs, etc. Also, Chanukah is the only Jewish holiday that spans two Jewish months — Kislev and Tevet. Therefore, we get to enjoy not only Chanukah, but also Rosh Chodesh. One tradition of Rosh Chodesh comes from the time when Moses came down from Mount Sinai and he found the Israelites worshipping the golden calf. According to the Midrash, the women refused to give their gold to help build the idol, so their reward was a special holiday once a month — Rosh Chodesh, the new moon. The tradition on Chanukah for women is that no work is to be done while the candles burn, therefore, Chanukah Rosh Chodesh is a very special night. As you celebrate this year, perhaps each night could be a time to learn about a different country and the way Chanukah is celebrated by those who live there. Are there different foods, different customs, different songs? An even more important question is, “What is the same?” What connects us to Jews throughout the world? Celebrating Chanukah means remembering the story of the Maccabees and how Jew fought against Jew to keep the traditions and the beliefs alive. Today, it continues to be a challenge to keep the essence of our Jewishness alive — we are the link in the tradition. So let us teach our children how to appreciate their differences first, by teaching and modeling Jewish life and all the beauty of it, and second, by learning about others and then going home to what we know and love. They study these tags for some time before choosing one — or sometimes two or even more, especially if the kids belong to the same family: Siblings are linked together on the tree, with a number (not a surname) identifying them. You see, this is a truly personal effort on a massive scale. Salvation Army puts up trees covered with tags in at least seven Dallas-area malls and hundreds more across the country. Volunteers verify everything. The program works like this: People take a tag to a desk and sign a pledge to return the requested items by a specified date. Every child’s wish is fulfilled by using red plastic bags, one for each, into which everything for that destination goes, with an identifying label on the outside. Then into the warehouse it moves, where everything is sorted by even more volunteers and readied for holiday delivery. “Oh, I just can’t leave ‘Ben’ there,” he said, signing up a second pledge paper and leaving to do more shopping than he’d planned. Lots of people bring their children with them every year, to get the feel of giving. One did something I thought was a very impressive teaching tool: She had her small son pick out a name, a boy. too, and just his own age, and took him shopping immediately. Just as immediately then, she returned to the tree, spread out the purchased gift under it, seated her son with them and took a great picture certainly destined to become a happy holiday memory. And I was lucky to be there on the right day at the right time when a women came by with her check for $1,000 and enlisted me in helping her figure out just how far that amount would go. “I do this every year,” she told me. I felt so lucky to have been her designated assistant. “This is my Christmas gift to myself.” Those who fear that the true spirit of the season has been lost can find it again, right here at the angel tree. So now comes the logical question: Why don’t I do this same kind of thing for our local Jewish community’s many holiday drives? Well, in fact, I do. But there’s something special to me in remembering that the man who founded Rotary did it to get people acquainted with their broader communities and their own local needs. And that he’d made had made sure someone of each major religion was included in his initial plans. He didn’t know, 100 years ago, how far that little candle would shed its beams. Abrams is on the faculty of Penrose Library and the Center for Judaic Studies at the University of Denver, as well as the director of the Rocky Mountain Jewish Historical Society and Beck Archives of Rocky Mountain Jewish History. The free lecture begins at 7:15 p.m. at the Aaron Family JCC, 7900 Northaven Road. We’ve all have been there: Waiting for the thick envelope from the college of one’s choice to arrive in the mail — or, in today’s digital age, the congratulatory e-mail. Can you imagine receiving that wonderful news in person? Last week, Yavneh students were in for a special treat when Austin College president Marjorie Hass visited the Schultz-Rosenberg Campus. Hass entered the beit midrash and, after saying boker tov and before delivering her remarks, asked if senior Rachel Rudberg was in the room. 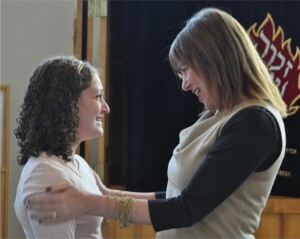 What a remarkable moment for Rachel, daughter of Dora and Cary Rudberg, and the entire Yavneh community. Hass spoke to the students about what to expect from college life and how it differs from high school. She also shared her own career path as a philosophy professor, provost and now college president. 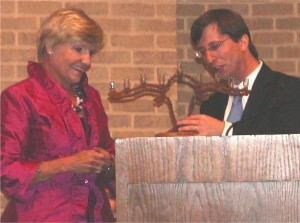 Along with Collin College’s Cary Israel and Rice’s David Leebron, Hass is one of the few Jewish college presidents in Texas. Programmer extraordinaire Bob Weinfeld stopped by this week to tell us that Dr. Bobby Brown, who had careers as a New York Yankees third baseman, a Fort Worth cardiologist and American League president, will speak Wednesday, Dec. 19 at The Legacy at Willow Bend in Plano. Southwest Jewish Congress president Gil Elan will open the 2:15 p.m. event with his monthly update on Syria and the Middle East. Brown will speak at 3:30. Brown played eight seasons with the Yankees and was instrumental in the Bronx Bombers’ World Series victories in 1947, 1949, 1950 and 1951, batting .439 in those four Fall Classic appearances. He retired from baseball after the 1954 season, then spent more than 25 years in his Fort Worth medical practice. He came back to baseball in 1984 to serve 10 years as American League president. The community is invited to the event, Weinfeld said. 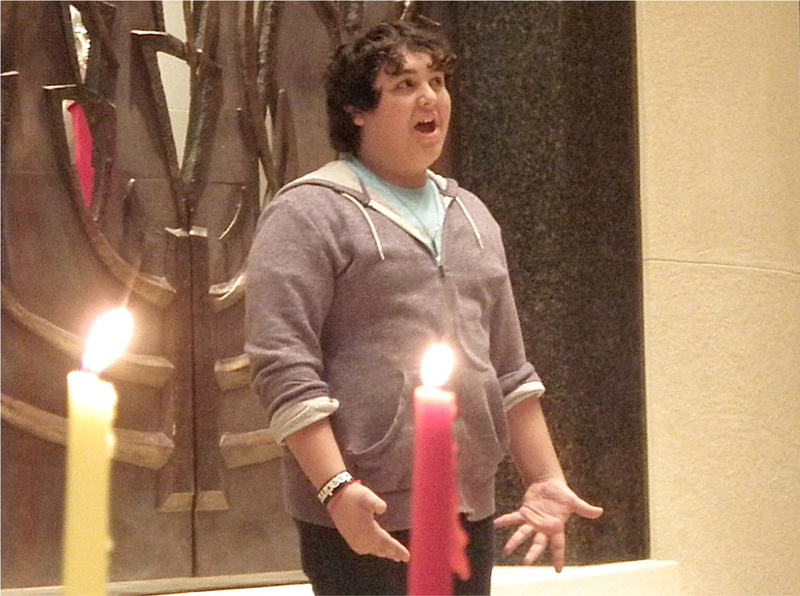 Congregation Shearith Israel will host area teens at 7:30 p.m. Saturday, Dec. 15 for a Chanukah-themed party at the synagogue, 9401 Douglas Ave. The glow party will include music, dancing, glow sticks, a latke bar and other refreshments. It is open to all Dallas/Fort Worth-area Jewish teens in grades 8-12. Admission is $5 (with the donation of two canned food items) or $10 without canned food items. The canned food and a portion of admission proceeds will benefit the North Texas Food Bank. To RSVP, contact Stephanie Buch, CSI youth director at sbuch@shearith.org. Akiba seventh-grader Jonathan Wilson cleaned up at the Texas Chess Association’s 16th annual Texas K-12 Grade Championships last month in Houston. 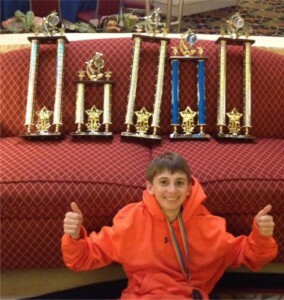 Jonathan brought home a total of five trophies. Among his accomplishments were a first-place finish for his overall grade level; first-place finishes in the Bughouse and Blitz speed chess competitions; and a most endearing first-place finish in the father and son tourney. Jonathan is the son of Joe. Tony Cassavechia has joined Munn & Morris Financial Advisors. Tony joined Munn & Morris after a long career in corporate finance with large, multi-national firms and, more recently, as a consultant to CFOs and their supporting teams. He previously served as senior vice president with the Heinz Corporation and divisional vice president and CFO with PepsiCo. Tony enjoys helping others, both as a consultant to business leaders and now extending his skills to individuals with their personal financial planning and wealth management. Tony is a CPA, has a Master of Business Administration, and recently completed a post-graduate certified financial planning program at SMU. We would like to hear from our readers. Send your news and photos to me at sharonw@texasjewishpost.com, or Sharon Wisch-Ray, 7920 Belt Line Road, Ste 680, Dallas, TX 75254. You can also phone us at 972-458-7283. The TJP offices will be closed Dec. 24-Jan. 1 and will reopen on Jan. 2. All news items must be received no later than Dec. 18 to be included in the issue of Dec. 27; Dec. 20 for issue of Jan. 3. As we prepare for Chanukah, many of us realize we have a level of Jewish knowledge called pediatric Judaism. But we can now begin to increase our Jewish knowledge today. Chanukah is more than a children’s holiday — it has an amazing story. Did you know the Maccabees were zealots? Did you know the fight began as one of Jew against Jew? Did you know that the real fear was not physical extermination but spiritual annihilation? The message to us is one of standing up for our beliefs because we know what we believe and we are proud of who we are. Let us teach our children to know who they are through our learning and understanding. Chanukah is a holiday with many wonderful rituals, and families continue to create new traditions to teach the special messages that are part of the historical event. It’s a wonderful opportunity. What are the messages we want our children to understand? We also teach our children that being small does not mean being insignificant. The Jewish people have always been small in number, but we have always been strong in spirit. We know that each of us can make a difference in the world. And this is the legacy of the Maccabees and the celebration of Chanukah. Chanukah is a wonderful holiday to create new traditions. Rabbi Cherie Koller-Fox, with her family, added new rituals, and here are her favorite Chanukah happenings. Cover the tables so the children can paint murals, make figures out of clay, make a new chanukiah for the season and more. Invite friends who like to play instruments and sing and have a song fest with a little karaoke (and maybe a talent show). Do something for others — buy a gift to donate, go to a home for the elderly, collect food and deliver it to a shelter. The gift for the night is a book for each person, followed by reading and storytelling. A night for a big family celebration. If you live far from family, this is the night to call everyone on the phone. Pick a movie that can be a family favorite for years to come (and, of course, make popcorn). Beth-El Congregation’s Winter Blood Drive will take place from 9:30 a.m. to 12:30 p.m. Sunday, Dec. 16 in the synagogue’s library at 4900 Briarhaven. If you want to request a time slot, call Dan Halpern at 817-223-9194 or at 817-426-3239. And moving into January, TCU’s Brite Divinity School, as part of its Cristol Lecture Scholar, program, will host Ross Kraemer as he talks about “Christian Bishops, Christian Emperors, Jewish Subjects: The Fate of the Mediterranean Diaspora” at 7 p.m., Sunday, Jan. 6 at Congregation Ahavath Sholom. I’ll get more information out to you as I receive it. Now, back to Chanukah. 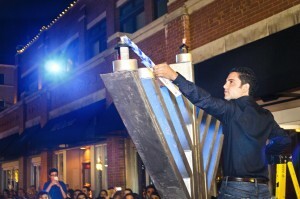 The wonderful news is that there are plenty of Chanukah activities going on throughout Tarrant County. Now another one has come to our attention — Beth-El Congregation at 4900 Briarhaven, is hosting a Chanukah Dinner and Celebration beginning at 6 p.m. Saturday, Dec. 8. In addition to dinner, those attending will be treated to a musical play, presented by Kids who Care, titled “Freedom Bound.” Following the play will be a dessert reception, games and crafts — in other words, fun for the family. The event is free, but RSVPs are necessary. Call the synagogue office at 817-332-7141. Congregation Ahavath Sholom’s community wide first-night-of-Chanukah event also takes place Dec. 8, across the street from Beth-El at 4050 S. Hulen. This event starts at 7 p.m. with candles to be lit by Fort Worth city officials and the Jewish bluegrass band Lucky Break from Milwaukee on hand for entertainment. If you plan to attend, please call the office at 817-731-4721 and let JoAnn know how many tickets you’ll need. 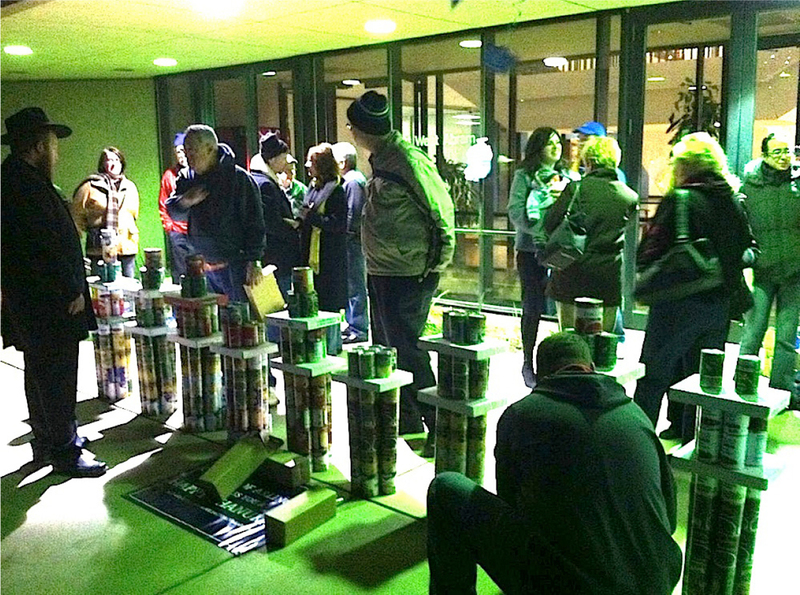 The Chanukah celebrations don’t end on Saturday — the next night, Sunday, Oct. 9, Chabad of Arlington will have its annual “Can-Orah” menorah lighting at 6 p.m., Sunday, Dec. 9 at Arlington City Hall, 101 W. Abram St.
An Arlington city official will be on hand to help light candles, and the event will feature live music and arts and crafts for the children (along with latkes and doughnuts). This event is also free and open to the public. Chabad of Arlington is also hosting a “Chanukah on Ice” from 4-6 p.m. Wednesday, Dec. 12 at Ice at the Parks, 3815 S. Cooper St. in Arlington. Ice skating, Chanukah music, latkes, doughnuts, hot chocolate and dreidels will be in abundance — as will the grand menorah lighting. The cost is $10 per person (and includes skate rentals) — $40 maximum for families. RSVPs are essential for this event — you can either let them know you’re coming by calling 817-451-1171 or emailing info@arlingtonchabad.org. Just in case you want more to do during Chanukah, Chabad of Fort Worth will have its annual Chanukah Bowl from 7:30 to 9:30 p.m. on Saturday, Dec. 15 at Cityview Bowling, 6601 Oakmont Blvd. in Fort Worth. In addition to bowling, the Chanukah Bowl will abound with dreidels, latkes and a light dinner, complete with chocolate gelt for the kids. Cost is $12 per person ($50 maximum per family). For reservations, call the Chabad at 817-263-7701 or log onto www.chabadfortworth.com. Does Beth-El Congregation have a night for you? Come on down for the synagogue’s “Trivia Night and Chinese Dinner,” which will take place at 7 p.m., Monday, Dec. 24 at 4900 Briarhaven. You can sign up as an eight-person team or individually (with teams being created). Daytimers will travel to The Legacy at Willow Bend in Plano Wednesday, Dec. 12. Legacy will provide transportation from Beth-El Synagogue (4900 Briarhaven in Fort Worth), along with lunch and Chanukah candle lighting. This is a terrific opportunity to visit with former our-towners Greta Beckerman, Shirley Cohen, Hanna Hochster, Nancy Rakoover and Dorothy and Harold Winston, as well as to help spread Chanukah cheer among Legacy residents. For information about this upcoming trip, or to make a reservation, contact Barbara Rubin at 817-927-2736 or log onto www.bethelfw.org. Just like there can’t be too much celebration of Chanukah, there can’t be too many reminders from yours truly to please send photos of Chanukah celebrations. Have photos of family get-togethers and cute kids lighting the menorah? Did you go to a classroom to teach younger kids about Chanukah (I did this when Young Sorter was in elementary school — most of the non-Jewish kids fell in love with my latkes)? Let me know by sending information to me at awsorter@yahoo.com. Chanukah is meant to be a time to feel our freedom and serve as a release from the oppression of our enemies. I’m anticipating having a hard time feeling that way this Chanukah, with the recent events in Israel which, although there’s a temporary lull in the action, doesn’t seem to be going anywhere good any time soon. The threat of a nuclear bomb from that madman (Iranian President Mahmoud Ahmadinejad) is only growing and the Arab Spring has only brought our sworn enemies to power, with Europe and the rest of the world condemning Israel and the Muslim presence, and sentiments growing everywhere. I just feel like we’re completely outnumbered. Can you help me find joy despite this situation? The truth is, Chanukah is not meant to feel freedom and be a release from oppression. The Chanukah miracle of winning the battle against the Assyrian Greeks was, in fact, only that: the winning of a battle, but not the war. Although they did win back control of the Temple in Jerusalem, the war continued to rage on in other locales, and the Jews remained under Greek oppression. The message of Chanukah is the message of hope. It teaches us that, despite the oppression, the hatred and subjugation to our enemies, we never lose hope and the hope in our hearts is the redemption. This message is implicit in how Chanukah is celebrated. 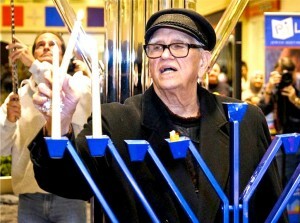 The celebration of Chanukah, the lighting of the menorah to commemorate the miracle of the oil, is performed at night. Night, the time of darkness, symbolizes the darker times of Jewish history. The symbolism of lighting the menorah at night is that we can always find light despite the darkness, we can feel hope even in the most difficult times. We can seek and find God even when He is “hiding’ from us. This is why Chanukah and Purim, the two rabbinical holidays, are celebrated in the winter, unlike the three Torah-based holidays, (Pesach, Shavuot and Sukkot), which fall in the summer. The Jewish concept of summer is that the days are longer than the nights; the light overtakes the darkness. The three Torah-based holidays celebrate times that God revealed Himself to us openly and clearly. They reflect times of tremendous clarity and illumination, so they take place during the time of light. Chanukah and Purim took place during times of exile and darkness, when God hid His countenance from us. Chanukah symbolizes that a little light can displace a lot of darkness. God remained completely hidden throughout the entire Purim story; hence, the name of God is absent from the Book of Esther. It necessitated a deep focus to piece together the puzzle of years of Persian exile to realize a tremendous miracle had occurred, behind the scenes, and God had, in fact, not forsaken them. This is one of the reasons we (ideally) light oil menorahs on Chanukah. The obvious reason is to commemorate that the miracle transpired with oil. The deeper message is that the oil is hidden within the olive. Only when you squeeze the fruit and get out what’s inside do you extract a liquid that sheds light. During Chanukah, we peer deeply within the miracle of our existence despite all the odds and myriad attempts to destroy us. Our history and the message of Chanukah teach us never to give up hope, both on a national level and in our own personal lives. We truly have much to be concerned about the events surrounding Israel and worldwide, and this should constantly be in our prayers. This situation, however, is precisely the message of Chanukah: Not to lose hope, to retain our trust in the almighty and His protection, and to experience tremendous joy deeply within our hearts that no darkness is powerful enough to extinguish the Light of the Jewish people. Am Yisrael Chai. With wishes to you and all readers for a truly joyous Chanukah, with peace and tranquility upon our brethren in Israel and throughout the world. Denise and Stew Levine and their children take the lyrics “Chanukah Oh Chanukah, come light the menorah” very personally. 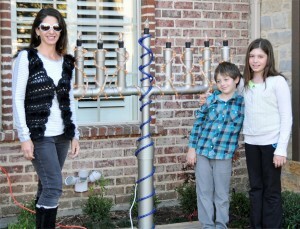 The family created its own menorah – and light up it does. The family’s menorah, which they built, stands tall and unique against its Plano neighborhood’s other holiday-lit homes. After lighting up the Levines’ yard this Saturday, the traveling menorah will find its way to the yards of the Feldman, Kam, Korenman, Rubenstein, Segal, Toppel and Zakon families as the holiday progresses. Last year, when Denise’s children, Naomi, 9, and Jeremy, 6, started asking the same questions, she felt it time to spring into action. “If you can visualize it, it can be done,” said Denise, who works as an interior designer. With some design help from her children, close to $400 in expenses for PVC pipes, lights and wiring and about 20 hours of construction time, the Levine family front yard shines bright — bright blue, silver and white. “It’s a small price to pay for something so special, and something that will last from year to year,” she said. After the Levines invited friends and relatives to light the menorah on the first night of Chanukah, Denise was depressed when she realized the family would be out of town most of the holiday and her special menorah would sit alone in the garage. She’s right about the excitement. 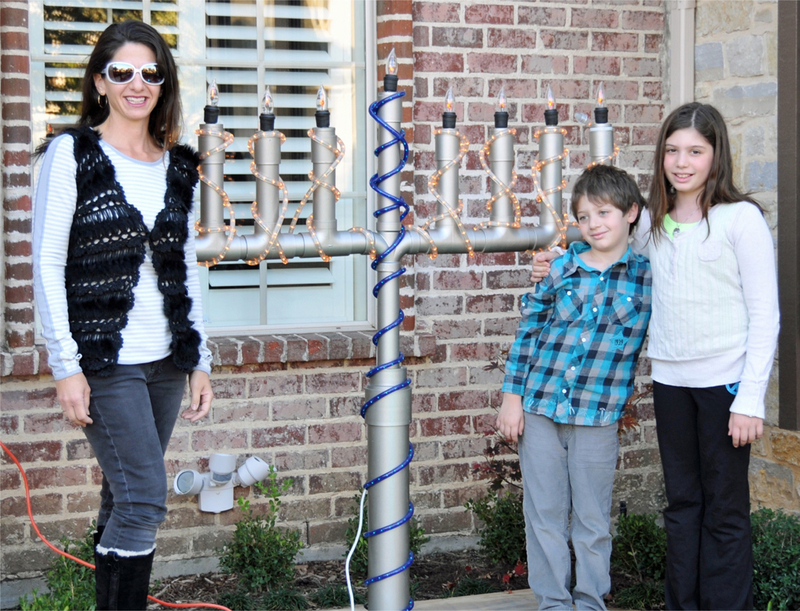 “My family is so excited to get to share the menorah,” said Wendy Korenman, a cousin of the Levines who will have the menorah in her yard for the seventh night of the holiday. “Denise has a heart of gold, and it’s great that she’s allowing so many families to be a part of this. The menorah will travel to families who fill the Jewish observance spectrum — friends from the Levines’ synagogue, Anshai Torah, and from the children’s school, Centennial Elementary. “We have friends who are Orthodox, Conservative and Reform who will all be lighting the menorah, and I like that it doesn’t matter how observant each person is — this is a holiday and everyone’s home will be lit with something we loved making,” Levine said.